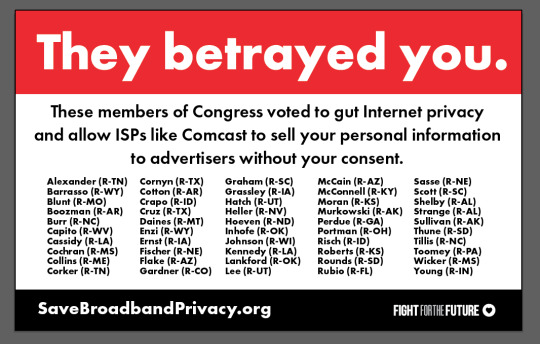 Digital rights group Fight for the Future, known for organizing massive protests against SOPA and for net neutrality, has announced that – if the bill passes – they will unleash billboards with the names of every member of Congress who votes to gut the FCC’s Internet privacy rules that prevent Internet Service Providers (ISPs) like Comcast and Verizon from selling their customer’s personal information to advertisers without their consent. The group released a draft mock-up of what the initial billboard – which will be unveiled in Washington, DC and in select districts – will look like, with the names of the 50 Senators who voted for the bill last week. They plan to launch a crowdfunding campaign to place additional in-district billboards in key lawmakers back yards, which will also include information about how much money in campaign contributions key lawmakers took from the telecom industry.